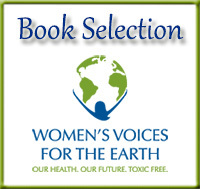 When Cancer Hits is a Women’s Voices for the Earth Book Selection. Cinco Vidas is proud to partner with Women’s Voices for the Earth (WVE), a national organization that works to eliminate toxic chemicals that harm women’s health. Together, Cinco Vidas and WVE are raising awareness about and taking action against toxic chemicals linked to cancer. A portion of book sales goes to WVE’s work empowering women to raise their voices for the right to live in a healthy environment.